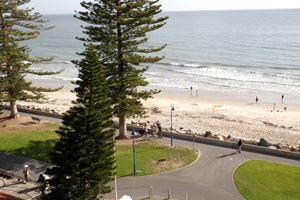 Superbly located on the absolute beachfront of Adelaide"s popular seaside suburb, Glenelg. This luxurious, three bedroom residential apartment has sensational views from all the main rooms to either: the sea or beach, city, hills and Glenelg area, and breathtaking panoramic coastal views from the generous balcony and living area. Walk out the front gate and you have the beach in front of you, tempting you to leisurely walk along its white sandy beach, build a sand castle or go for a swim. Or relax in the Beachfront Apartment and enjoy the tranquil ambience, the exquisite views of the sunsets over the Gulf of St. Vincent and the night time cityscape views. Quiet, peaceful surroundings yet the Beachfront Apartment, is a leisurely few minutes walk to the famous cosmopolitan Jetty Road where you can enjoy the seven day shopping, wine and dine at a myriad of restaurants, relax in a sidewalk caf�, have fun at one of the entertainment venues, board the historic or modern Glenelg tram and travel to the City. A short stroll takes you to: the new Holdfast Shores Marina, the Jetty, the new Beachouse, local library & playground, the Stamford Grand Hotel, as well as many other attractions Glenelg has to offer. The perfect environment for leisurely days of indulgence. 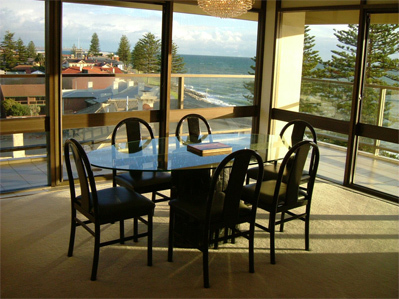 Stunning views from all the main rooms to either: the sea/beach, city, hills or Glenelg area. Second bathroom with walk-in shower, single spa bath, toilet, vanity, hair dryer, bathrobes and quality towels. Please note: No smoking permitted inside apartment, smoking outside only. No pets allowed. Our aim is to listen to your personalised accommodation and tailor a package to suit you. Access to the Beachfront Apartment is from the South Esplanade and Oldham Street. Please note: Vehicular access is prohibited on the South Esplanade. Only pedestrians and cyclists are permitted. Entry to the secure, undercover car park or visitor"s car park is from Oldham Street. You will be met at the property for check-in no earlier than 2:30 p.m. on your date of arrival, unless otherwise arranged. Regarding check in, could you please phone Anita"s mobile: 0411 102 773 about 30 minutes prior to check in. Kindly check-out no later than 10:00 a.m. on your date of departure, unless otherwise arranged. Please remember to leave keys and the air key remotes inside the apartment.